Judith’s Music provides high quality piano and early vocal tuition to students of all ages and skill levels. 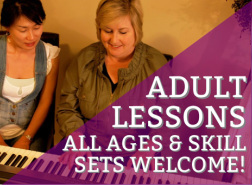 If you've always dreamed of learning how to play the piano or sing, you've come to the right place! Judith believes that music is an activity and pleasure that should be enjoyed for a lifetime. Please browse through the website and find out more about Judith, her services, and how she can fulfill your music education goals. With Judith's help, my daughter received an A+ result on her last AMEB exam. I would recommend her services to anyone.